I want to say thank you to all my loyal customers – those that come back to buy from me again and again. Thank you for supporting my home-grown and spray-free gardening business passion. Whether you come to my premises on a sunny day, or to the markets in temperamental wind and rain, or even when you buy my herbs and flowers online – THANK YOU, this is for you! 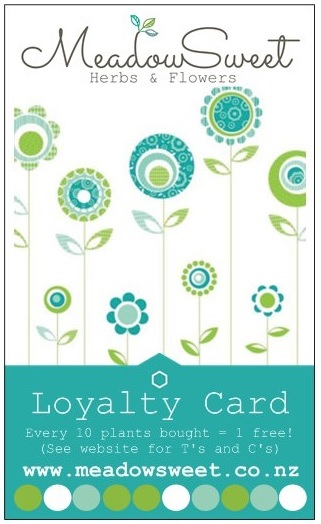 With your next purchase, you can get a MeadowSweet Herbs & Flowers Loyalty Card! For every ten (10) plants you buy from MeadowSweet, you can choose a plant for free (dependent on plant availability and size). Choose from our 6-cell trays or small bagged (500ml capacity) range including common culinary herbs, the uncommon medicinal and cosmetic herbs or perennial cottage garden flowers, companion plants, edible flowers, vegetables or fruit and berries.